A stocking filler whirling with snowy magic! 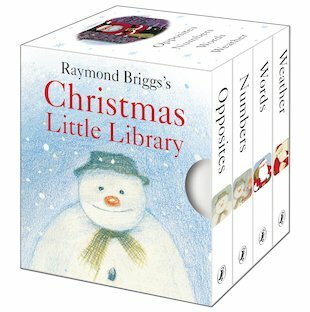 The Snowman and Father Christmas take you walking in the air and galloping over rooftops in a beautiful quartet of mini books which teach first concepts, including seasonal weather. Based on two bestselling picture book classics, these wonderful little board books are full of things to learn: opposites, first words, numbers and weather. Featuring a pair of truly timeless characters, they’re the perfect way to celebrate Christmas Day. Create a winter wonderland with this magical Snowman picture. Raymond Briggs has twice won the Kate Greenaway Medal for Father Christmas and his Mother Goose Treasury, and has also won the Nestle Smarties and Kurt Maschler awards.